The fact that there are so many rose types, is often enough in itself to turn people off growing roses. It doesn't have to be that way, I am going to simplify the various types of roses so that you can choose the rose you want for your garden. It really is a lot more simple than some people would have you believe and you too can enjoy the beauty of growing your own roses just as millions of others do. Below is an easy to understand explanation of the varieties available when growing roses. These are often referred to as Cabbage Roses and Provence Roses. With their most glorious scent, these old fashioned roses what everyone probably imagines how a rose should be. 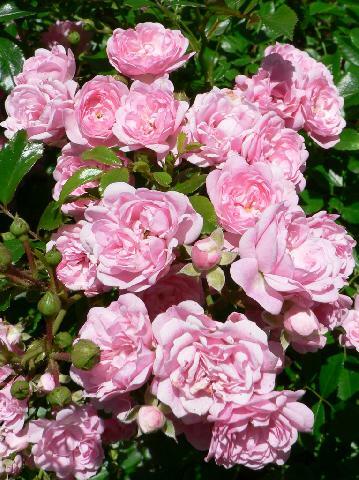 The care of Centifolia roses is greater than other rose types. Their stems are soft and pliable and they demand regular spraying and feeding or they just won't flourish. These are related to the Centifolia type of rose. Believed to be in existence for about 300 years they are very similar to their relatives, except for the very fine but sticky hairs that are on the stalks and sepals. This moss like hair is the source of this roses name. They have double blooms that are very sweetly scented and some types are repeat flowering. These are a very compact rose that rarely grow more than 3 feet. Extremely hardy their large clusters of small blooms will continue flowering right through summer and autumn. These rose types are commonly known as French roses. Colors can range from a deep purple through to a light pink. If you had to chose one of these rose types to start off with, go for Rosa Mundi as it does well in poor quality soil and has the added benefit of being thornless. If you are looking for a type of rose that won't sulk at the lack of attention or looking for roses to form a hedge then this could be the rose for you. They tick all the boxes as regards rose bush care and maintenance, are also fragrant and highly disease resistant, will thrive in poor soils. With some support these two types of roses can be trained to climb up, through and over objects or other plants. Rambling rose types are roses that are once flowering, have long flexible stems and when they do bloom they do so with large trusses of small flowers. The rose types referred to as Climbing have stiffer stems, are often repeat flowering and the flower blooms are a lot larger. Increasingly popular type of rose and with good reason. Generally they are repeat flowering and so provide color all season long, the fact that blooms are carried on long trusses flowering at the same time just adds to their appeal. These are the famous long stemmed roses that florists and gardeners rave about. Although many of the other types of roses mentioned are becoming increasingly popular these are still the worlds favourite. They can be had in the more informal bush type or the more formal standard. Hybrid tea rose types have large or medium sized blooms that have a tight cone shape of petals in the centre that open up gradually to the outside. Exactly as their name suggests, these types of roses usually do not exceed 14 inches in height. These rose types are rapidly becoming a household favourite because of their versatility. 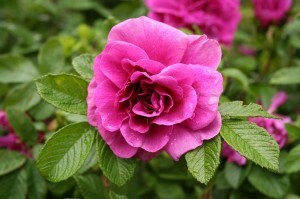 They can be used rose beds as well as edging of lawns and borders. Also a very useful way of growing roses in containers. A great way to start out for the novice rose grower useful for growing roses for beginners. 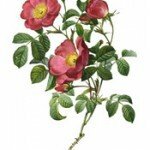 Thinking of growing roses indoors? with the right conditions these types of roses can be used for growing roses indoors. These are different types of roses to miniature roses, in fact they are smaller versions of Floribunda roses. They too can be used in beds, for growing roses in containers and as edging on paths, driveways. 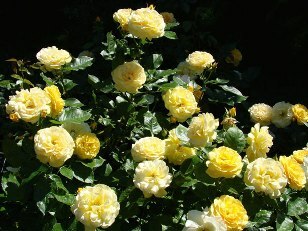 These types of roses vary from very low growing, almost ground hugging, to about 5 feet tall. Very disease resistant they are great roses for covering those parts of your garden that you wish weren't so obvious. If you are looking for a climbing rose that is multi-colored and flowers all the way to first frosts Josephs Coat might be the rose for you. 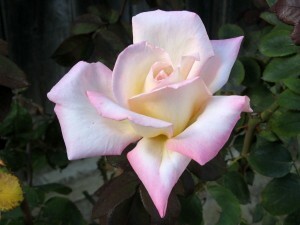 The link directly above provides more detail on this type of rose.